Communication Not a Problem for Taiwanese Pilgrims. JEDDAH,KSA(by ARABNEWS.com), |17:55, 26 January 2004|. A total of 25 Taiwanese, 11 men and 14 women, are performing Haj this year. The oldest among them is a healthy 74-year-old retired sailor. It took him a long time to prepare for the trip and make the decision since Haj is such a serious undertaking. 'Once he performs it, he is not supposed to do anything wrong,' explained Salahuding Ma, the head of the Taiwanese Haj mission. The youngest in the group are two 20-year-old university students, a man and a woman. The boy is studying medicine and the girl is studying Arabic, providing some needed translation for the group along with the little English they speak. The group also includes a doctor and his wife who is a nurse. He converted to Islam 30 years ago when he married her; this is their first Haj. A few additional Taiwanese pilgrims are expected to arrive as guests of Custodian of the Two Holy Mosques King Fahd, who invited 1,000 pilgrims from around the world - as he does every year - to perform Haj at his expense. It is a long way for these pilgrims, but the longing for Haj is strong and these days it is much easier and less expensive. On the other hand, Ma also told Arab News that there used to be more job opportunities for Taiwanese here and that those who worked here provided support to the Taiwanese pilgrims. The Taiwanese will return home on Feb. 11, making the most of this opportunity to be in both Makkah and Madinah. They come from different regions of Taiwan, large cities and small villages, although the majority of Taiwanese Muslims live in the capital, Taipei, according to Ma. 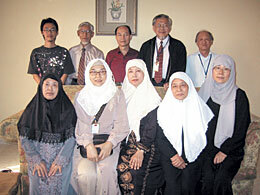 'We are a minority in Taiwan; that is why we need to do more as Muslims,' he said. There are between 50,000-60,000 Muslim Taiwanese, many of them immigrants from countries such as Malaysia, Burma and Pakistan, according to Ma. They are meeting pilgrims from different countries and making friends; communication is not a problem. Author: Maha Aqeel, ARABNEWS.com Staff.